ARE you one of those fortunate persons who regard eating as a fine art? Do you get the same esthetic thrill out of a savory dish of bouillabaisse a la Marseilles that you do out of Beethoven’s “Moonlight Sonata” or a Whistler nocturne? 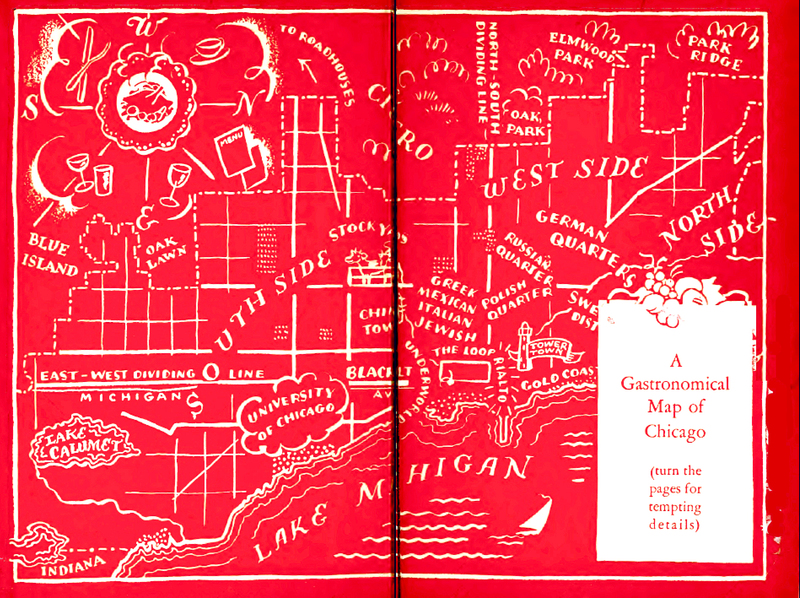 If so, then Chicago, despite the havoc wrought by prohibition, still has gustatory delights in store for you. It has been maintained by some that dining, under the restrictions of the noble experiment, has become a lost art. There are chefs who look back with regret on certain game dishes, the preparation of which called for a prolonged bath in wine. Bon vivants will tell you that a French or an Italian table d’hote is impossible without the grape. To be sure, the older generation doubtless fared better than we do today. 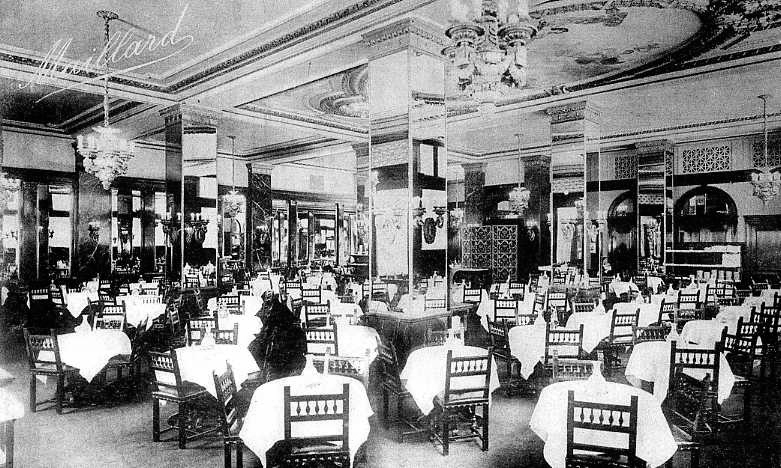 The Grand Pacific—now a memory^—was famous for its cookery, and John B. Drake’s game dinners, with their bewildering courses of quail, partridge, pheasants, reed birds, buffalo steak, bear steak, and venison, have passed into history. Kinsley’s is gone, and Abson’s chop house. Rector’s, Voegelsang’s, the Edelweiss, Stillson’s, Mangler’s, the Hofbrau, and Old Quincy No. 9 did not survive the prohibition era, and the Tip Top Inn with its picturesque Dicken’s room and “Nursery,” and its sunny waiters, was the last to go. But despite the casualties, Chicago is anything but a desert from the epicure’s point of view. Its elegant hotel dining rooms, its historic restaurants, and its obscure little cafes and coffee houses of the foreign quarter provide dishes as skillfully cooked, as appeti2,ing, and as varied as can be found in any city of the United States—New York, San Francisco, and New Orleans included. Certain globe-trotters perhaps will be inclined to challenge this statement, maintaining that it is impossible to dine anywhere but in Paris. But what kind of folk are they? Usually the kind who tell you superciliously that “they order such things better in Europe,” and have never taken the trouble to investigate the gastronomical resources of their home town. They have never ventured out around the corner in search of interesting restaurants and cafes. Yes, you can dine in Chicago! Even Brillat-Savarin, that prince of epicures, would not be disappointed. He would find everything here to satisfy his sensitive palate and to gratify his curiosity for exotic viands. Nor would he have to go more than three miles in any direction from the Loop to discover the culinary creations of practically every nation in the world and well cooked, too. Chefs, maitres d’hotel, and head waiters who have received their early training in the establishments of his beloved Paris, or elsewhere on the continent, would be his to command. Every dish known to the French and German schools of cookery, which, as everyone knows, are the world’s leading schools, would be ready for his approval. Go two miles south of the Loop, for example. Here, almost within shadow of the great white skyscrapers of the machine age, stands a little oriental coffee house, a bit of the Near East, where sultryeyed Arabs eat arische mahshi or sit about and smoke those bubbling Turkish water-pipes. Arische mahshi, in case you don’t know, consists of grape leaves stuffed with bits of lamb, and rice. Or go to 22nd street and Wentworth avenue, the heart of Chinatown. Here, numerous dining places, decorated in teakwood, mother-of-pearl, red lacquer, and gay with fat lanterns, cluster about the pagodas of the Chinese “city hair”‘ and offer all the exotic viands of the Far East—chicken bird’s nest soup, fried shrimps with soy sauce, chow mien suhgum, kumquats, lichee nuts, almond cakes, and the like. Go still farther south, to a charming restaurant in the Japanese quarter around historic Lake Park avenue, near 37th street. Dainty Nipponese maids wiU serve you a typical suki-yaki meal—a most appetizing dinner of thin slices of fried beef, fresh vegetables and various Japanese sauces. What’s more, it is cooked right at your table, Japanese style. And you won’t mind the fact that the Japanese quarter is located in the great south side black belt, for these are the restaurants where Southern dishes may be had — fried chicken beaten biscuits, barbecue Sandwiches, Southern hash and red beans and rice East of the black belt, in the white section along Lake Park avenue, stands a small French restaurant serving the best oysters and soft shell crabs in town. Most of Chicago’s foreign restaurants, however, are located across the river on the near west side, adjoining the tenement areas of South Halsted street. Although placed in dingy environments, they are clean and sanitary, and the waiters are always courteous to strangers. Delicious lamb chops are the specialite de la maison of a quaint Greek cafe a half block north of Hull House, on Halsted street. Having an old world atmosphere unHke any other restaurant in town, the cafe is noted for its little summer garden in the rear. A block southward is a Mexican restaurant, the rendezvous of consuls and consular attaches of Latin American countries, of Mexican caricature artists, Hull House residents, and newspapermen. All the native specialties are on the menu: sopa de arroz, gallina con molle poblado, frijoles refritos, tortillas, and chocolate y pan. For the dishes of sunny Italy you have only to walk two blocks farther south, to the intersection of Halsted and Taylor streets, which is the cross-roads of the west side’s “Little Italy.” Italian opera singers and politicians are seen almost every night in the many spaghetti restaurants of the quarter. These places all serve an excellent cuisine—antipasto, ravioli, spaghetti, NapoIitano, roast chicken, veal al Marsala, and such items. Up and down Roosevelt road, the great highway of the Jewish quarter, you will find the famous kosher restaurants of the city, several of them being frequented by such famed theatrical stars as George Jessel, Eddie Cantor, and Al Jolson. Others cater to Jewish intellectuals and writers. Roumanian dining places are located along 14th street, in the district known as “the Valley,” while Lithuanian restaurants serve their native dishes in the vicinity of 18th and South Halsted streets. For true Bohemian dishes, you must go to a place on West 26th street, in “Little Pilsen.” Plum dumpling, with cottage cheese; roast duck, with sauerkraut; Prague salami, with raw onions; liver sausage; and the toothsome Bohemian pastries, such as \olac\y and huchty sma\en, are all featured on the menu. Northwest of the Loop, along that busy highway, Milwaukee avenue, stand the restaurants of the Polish and Russian quarters. Borscht, kasha and goluptse and other Muscovite dishes are served in a workers’ cooperative restaurant, operated by the communists. The foods are highly appetizing if a bit heavy; the atmosphere comes up to expectations, and you needn’t be afraid that anyone will toss a bomb. Around the corner from this bit of Russia, you will find a Polish dining room. The Poles are very fond of mushrooms, and employ them as a garniture for many, if not most, of their main dishes. In this restaurant you may obtain the favorite Polish dish Ztrazki po Nelsonsku —in other words, beef filet á la Nelson. It is served with sour cream gravy, mushrooms, and potatoes en casserole. Delicious pastries, prepared by expert chefs from Krakow, provide you with a wide choice for dessert. Any survey of Chicago’s worthwhile restaurants will convince you that the oldest and most outstanding are of German atmosphere. This is only natural, as the Germans were among the city’s pioneers, and still make up one of the largest racial groups in Chicago. Their restaurants, redolent of the grand old days, are located in many parts of the Loop, and also on the near north side. One of the most famous dining parlors in the country is an unpretentious German place in Wells street, between Madison and Washington, its scoured floor, its mahogany bar, its tables and woodwork mellowed by time. 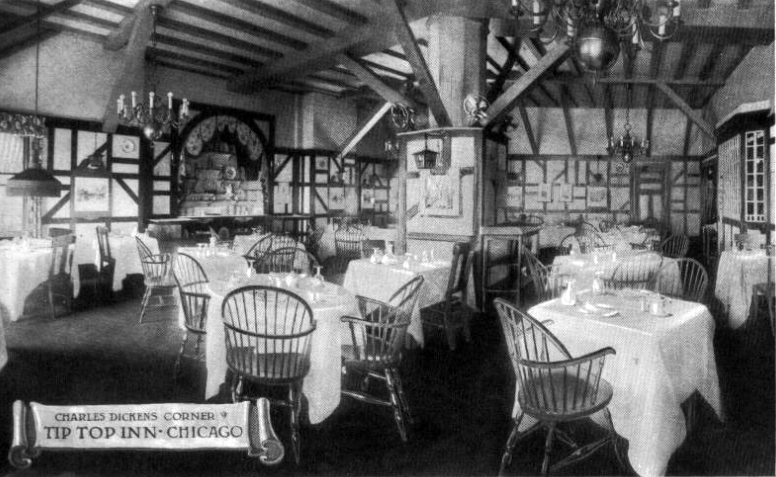 Here, every Saturday at noon, Chicago’s famous authors and poets regale themselves with generous helpings of Wiener schnitzel or Koenigsherger klops, seated at a big round table. Celebrities visiting Chicago during the World’s Fair of 1893 came here to sample the rare wines, and practically every man of note in the world of letters who has visited the city within the last forty years has been entertained here. Tucked away in a little side street just south of the Loop is a famous English grill, where, in a typically British atmosphere, one may enjoy his Southdown mutton chops, his juicy steaks or roasts. Swedish restaurants, with their smorgashords, abound on the North Side in the vicinity of Belmont avenue and Clark street. One must be careful, however, not to fill up on the delicacies laid out on the central table—the salt and smoked fish, the anchovies, and the sardines in oil for these are only skirmishers; there is much more coming. John Drury loves Chicago very much. It is neither an ethereal nor an ephemeral love that John has for the Windy City. John walks, rides and flies over it. He eats and sleeps anywhere in it. A thousand cops know him. So do all the reporters, and he never gets into trouble.